Built for San Francisco businessman Sidney Bazett-Jones and his wife, the Bazett house is one of Wright's Usonian-style homes. It was designed in the late 1930s and constructed in 1940. Bazett-Jones as an ambitious businessman who became vice president of the Bank of America in his late 30s. His wife of four years was Louise Reno, from a well-known San Mateo family. The couple wanted to build a dream home on property they owned in Hillsborough, south of San Francisco. They contacted Wright to be their architect and spent several years corresponding with him about details. He designed the house in the late 1930s and construction was finished in 1940. This low, Usonian-style house is built in a double V-shape. Like the Hanna House in nearby Stanford, it is based on a hexagonal unit. The walls are made of red brick and laminated redwood, with a massive central chimney. A carport separates the main house from a small guest wing. Today, it has four bedrooms and four baths and occupies 2,200 square feet. Features inside include built-in bookcases, a bench with a garden view, clerestory windows and an open kitchen. What happened next is a short but sad interlude before the house's current owners, Betty and Louise Frank moved in. Just before the young couple's home was complete, their baby was stillborn. Six months later the U.S. entered World War II. They moved away. After they left, the house entered one of the most intriguing (albeit short) periods of its history. According to the website Eichler Network, Joseph Eichler rented the Bazett House for a time. He was so much in love with the house that he reportedly sabotaged attempts to sell it and some people say he boldly declared that he would only leave the house feet first. The Franks bought the house in 1945. If they had not evicted Eichler, he might have settled down comfortably and never developed the 10,000 mass-produced, carefully crafted, open-plan homes that made him famous. Read the whole story here. The Frank family lived in the house for more than 55 years. It remains a private home today. If you want to know more about Usonian architecture, ​try this article that explains it - or read Frank Lloyd Wright's Usonian Houses by Carla Lind. The house is a private home and not open for tours. You can drive by, but because of its location on a hillside and surrounding vegetation, it's nearly impossible to see more of it than what was captured in these photographs. You can see a couple of photographs and the original floor plan here. The Bazett House is one of eight Wright designs in the San Francisco area, including two of his most important works. 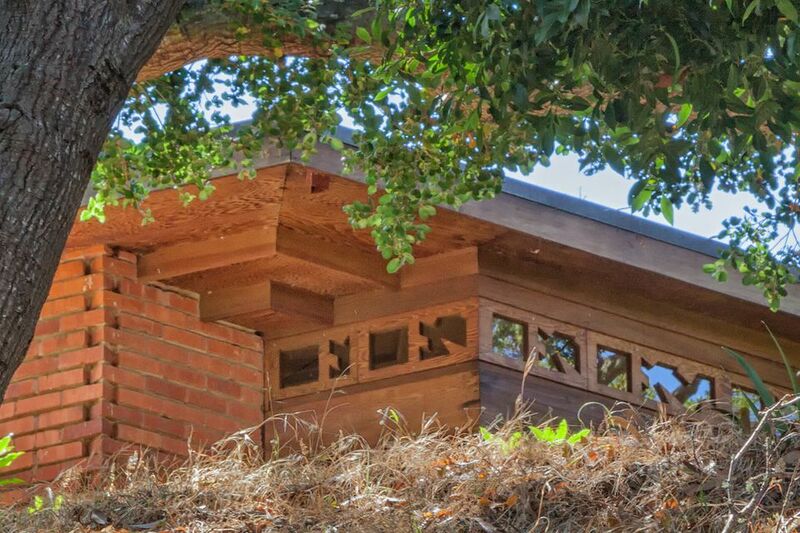 Use the guide to Frank Lloyd Wright in the San Francisco area to find all of them. Wright's Usonian houses were designed for middle-income families, they featured indoor-outdoor connections and were often built in an "L" shape: Hanna House (which is based on an octagon), Buehler House, Randall Fawcett House, Sturges House, Arthur Mathews House, and the Kundert Medical Clinic in San Luis Obispo (which is based on a Usonian House design). Wright's work isn't all in the San Francisco area. He also designed nine structures in the Los Angeles area. Use the guide to Wright Sites in Los Angeles to find out where they are. You'll also find several houses, a church, and a medical clinic in some of the most unexpected places. Here's where to find Wright sites in the rest of California. You'll find examples of Victorian style architecture all over San Francisco, including the famous Painted Ladies of Alamo Square. Other sights with particular architectural interest include the San Francisco Museum of Modern Art, the deYoung Museum and Renzo Piano's Academy of Sciences in Golden Gate Park, and the Transamerica Building. Nearby in San Jose, you'll find a city hall designed by Richard Meier. In Silicon Valley, the big-name tech companies like Apple, Google, Nvidia, and Facebook have buildings of architectural importance, but most are off limits except to their employees.